The Sangam Age constitutes an important chapter in the history of South India. According to Tamil legends, there existed three Sangams (Academy of Tamil poets) in ancient Tamil Nadu popularly called Muchchangam. These Sangams flourished under the royal patronage of the Pandyas. The first Sangam, held at Then Madurai, was attended by gods and legendary sages but no literary work of this Sangam was available. The second Sangam was held at Kapadapuram but the all the literary works had perished except Tolkappiyam. The third Sangam at Madurai was founded by Mudathirumaran. It was attended by a large number of poets who produced voluminous literature but only a few had survived. These Tamil literary works remain useful sources to reconstruct the history of the Sangam Age. Many historian consider the First two sangam age as mythical as the traditional dates greatly are not in accordance with the Historical dating and Each sangam age spanned around 2000 Years and the first sangam age according to the traditional dates started before 5000 or 6000 BC, at that point of time the four river valley civilization were in their nascent state or yet to be started. According to the sangam poems the First Sangam age was based in the city of south Madurai and the Second sangam age was based in the city of the Kapatapurm but these two cities were believed to be destroyed by the floods and rain and the latter sangam age was based in the city of Present day Madurai city in Tamil Nadu. (The Coromandel Coast of the South India are susceptible to Tsunami waves. The corpus of Sangam literature includes Tolkappiyam, Ettutogai, Pattuppattu, Pathinenkilkanakku, and the two epics – Silappathigaram and Manimegalai. Tolkappiyam authored by Tolkappiyar is the earliest of the Tamil literature. It is a work on Tamil grammar but it provides information on the political and socioeconomic conditions of the Sangam period. The Ettutogai or Eight Anthologies consist of eight works – Aingurunooru, Narrinai, Aganaooru, Purananooru, Kuruntogai, Kalittogai, Paripadal and Padirruppattu. The Pattuppattu or Ten Idylls consist of ten works – Thirumurugarruppadai, Porunararruppadai, Sirupanarruppadai, Perumpanarruppadai, Mullaippattu, Nedunalvadai, Maduraikkanji, Kurinjippatttu, Pattinappalai and Malaipadukadam. Both Ettutogai and Pattuppattu were divided into two main groups – Aham (love) and Puram (valor). Pathinenkilkanakku contains eighteen works mostly dealing with ethics and morals. The most important among them is Tirukkural authored by Thiruvalluvar. Silappathigaram written by Elango Adigal and Manimegalai by Sittalai Sattanar also provides valuable information on the Sangam polity and society. In addition to the Sangam literature, the Greek authors like Megasthenes, Strabo, Pliny and Ptolemy mention the commercial contacts between the West and South India. The Asokan inscriptions mention the Chera, Chola and Pandya rulers on the south of the Mauryan empire. The Hathikumbha inscription of Kharavela of Kalinga also mentions about Tamil kingdoms. The excavations at Arikkamedu, Poompuhar, Kodumanal and other places reveal the overseas commercial activities of the Tamils. The chronology of the Sangam literature is still a disputed topic among the scholars. The sheet anchor of Sangam chronology lies in the fact that Gajabhagu II of Sri Lanka and Cheran Senguttuvan of the Chera dynasty were contemporaries. This is confirmed by Silappathigaram as well as the Dipavamsa and Mahavamsa. Also the Roman coins issued by Roman emperors of the first century AD were found in plenty in various places of Tamil Nadu. Therefore, the most probable date of the Sangam literature has been fixed between the third century BC to third century AD on the basis of literary, archaeological and numismatic evidences. The chief towns and seaports and the foreign merchandise of the Tamil country, as described in the Tamil poems correspond exactly with those given in the works of Pliny, Ptolemy and in the Periplus Maris Erythrsei. Pliny died in 79 AD; and had completed his Natural History two years previously. The unknown author of the Periplus was a native of Egypt, and wrote his book after the time of Augustus Caesar, and before the kingdom of the Nabathceans was overthrown by the Romans. A more definite indication of his date is furnished by his mentioning Zoskales as the king reigning in his time over the Auxumitae. This Zoskales is identified with Za-Hakale who must have been king of Abyssinia from 77 to 89 AD. Buddhism was paramount, and non-Aryan races were in power, almost everywhere throughout India. To the Aryans it was a period of humiliation, and to Brahminism one of painful struggle for existence. When, in later years, Brahminism was again favored by royalty, it appears to have exerted all its energy, to erase every trace of the rival faith and foreign dominion. Accordingly the Sanscrit literature of the first century of the Christian era is now a perfect blank. Curiously enough, a considerable portion of the Tamil literature of that very period has come down to the present, almost intact, and reveals the condition of not only the Tamils, but also of other peoples who inhabited the rest of India in that remote age. There were Buddhists in the Tamil country, but they had set up no images of Buddha and had no priests ; there were Nigranthas who called the Buddhists heretics, but who had not commenced the worship of their Saints or Tirthankaras; there were temples dedicated to Siva, Vishnu and Subramanya, but there were also other shrines in which the worship of Indra and Baladeva was continued; there were Brahmins who wore the sacred thread and called themselves the "twice-born" but neither kings nor merchants sought this distinction; there were Tamils living in walled towns and cities, but in some parts of the country they still led the life of nomads and had no settled habitation. Towards the end of the third century AD, the Sangam period slowly witnessed its decline. 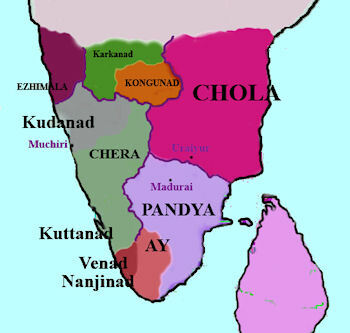 The Kalabhras occupied the Tamil country for about two and a half centuries. There is little information about the Kalabhra rule. Jainism and Buddhism became prominent during this period. The Pallavas in the northern Tamil Nadu and Pandyas in southern Tamil Nadu drove the Kalabhras out of the Tamil country and established their rule.